Benchmark day makes me nervous, so nervous that on my cross town ride I had to stop for a nervous poo at a truck stop. I used the opportunity to tighten a creaky chainring bolt that'd been bugging me, then on to meet Jim, BJ, Justin, Christian and Craig at the Rosanna Safeway. In a repeat of Thursday it was cold, my GPS had us dipping below zero a few times, but despite that I never felt too bad, or as is more common, I never felt nothing (numb toes/ears/fingers). The turn into Antoinette Boulevard came quicker than I'd hoped, right off of Main rd, and straight into a series of small kickers. I tried to hold a steady pace, not too dig too deep too early, to keep something in the legs for when everything was screaming. Holding pace along Lavender Park rd Jim was with me, beside me, behind me, around me... somewhere. His presence more of a feeling and a sound than a visual body. His breathing was hard, but then so was mine, a left turn into Hillcrest and the road tips up slightly. I stood up to get some extra power down and try and keep my pace going, as the blood rushing through my ears became the norm I realised Jim was no longer with me. Alone in my box, I tried to ride a sensible TT, steady exertion that built to a crescendo, but at times (the false flats) I wished for another rider to test if I really was putting in everything. 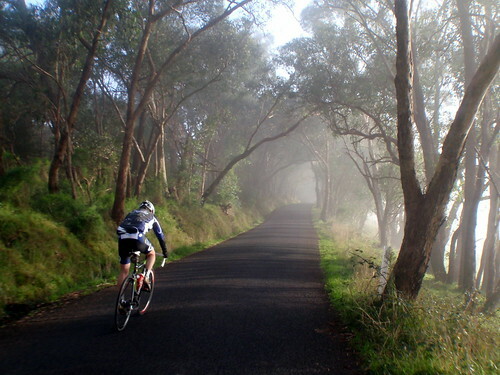 Relying on strava to track the time meant I rolled straight over the top and through to Research-Warrandyte Road. I now know I rode it in 17 minutes 23 seconds. 11 seconds faster than last time, 4 faster than the fastest time I've done. The rest of the ride was still going to be tough, not everyone had decided to play the ITT game, so there was a mix of fresh/used legs and fitnesses to contend with. We twisted and turned through the punchy back roads of Warrandyte, Kangaroo Ground and Watsons Creek, the pattern becoming clearer on each hill. Craig would hit it hard, out of the saddle stomping away. Jim would follow, perhaps seated, I'd look at them a few bike lengths ahead and conduct a mental review of my motivation before finally deciding to give chase. I stayed seated as much as possible, working to find the place that's worked well for me recently. Hands on the tops of my bars, thumb hooked over the top with the fingers relaxed, arms relaxed, shoulders relaxed and legs trying to pull clean circles. Slowly the two smaller figures would come back towards me, I'd match their pace for a moment, then the next time the road got steeper I'm put a bit more power through the pedals and start to pull away. So with this in mind, the fact that I was feeling confident about my ability to climb against riders I know to climb well, I was sad when I stopped to investigate an odd noise from my bike, and found my frame had finally decided to break. So I'm in a weird mental space. I feel great about my ability to ride a road bike... but I wont have one for a little bit.